IT’S ONE OF the most iconic photos of President Michael D. Higgins. The image shows our President perched over a BMX as two young men on either side of him prepare to whoosh down a halfpipe. It’s been shared too many times to count and gone viral on Reddit on several occasions, most recently in the wake of Trump’s election. But what’s the story behind the photo? Michael Donnelly is a freelance photographer based in Co. Kildare. He explained to DailyEdge.ie how the photo came about. It was at Sea Sessions and he was on the presidential campaign. I bumped into him and I asked him if he would do a photograph. At the time, Sea Sessions was hosting an area devoted to BMXing and skateboarding, and so Donnelly suggested that Higgins hop on a BMX for the laugh. Higgins kindly obliged and an iconic image was born. As a freelance photographer, however, Donnelly wasn’t on assignment and the image was taken on spec in the hope that one of the newspapers would purchase it the next day. Amazingly, nobody took him up on it. Not one paper would use it. There you go. Aware that he had something special on his hands, Donnelly shared the image on Facebook and it quickly spread like wildfire across the image. Donnelly explained to DailyEdge.ie that the image was shared on Reddit and other sites, which he wasn’t initially pleased about, given that it directly impacted his livelihood and ability to sell the photograph. It was very much out of my power and I was annoyed as a freelance photographer, but it had just taken on a life of its own. He added that he was a little irked by people on the internet defacing the photo by “changing it to a tricyle or a motorbike” or “adding rainbows to make him look like a leprechaun”. Following Higgins’ election, Donnelly bumped into him on several occasions, including at Sea Sessions where they had this priceless encounter. A few months later, Donnelly found himself at an event in Trinity College where he was photographing Sinead O’Connor. Knowing that President Michael D. Higgins and Sabina were also in attendance, Donnelly brought along a framed copy of the copy. I met himself and Sabina, and I brought the photograph and presented it to him. It was Michael D meets Michael D.
Imagine. There’s a photo of Michael D on a BMX hanging up somewhere in the Áras. At the end of the day, Donnelly says that he’s immensely proud of the photo and that “everyone knows it” even if they don’t know who’s responsible for it. And to think no newspaper ran with it back in 2011. For more information on Michael Donnelly’s work, visit his Facebook or contact him on info@michaeldonnellystudios.com. Email “This is the story behind *that* iconic photo of Michael D on a BMX”. 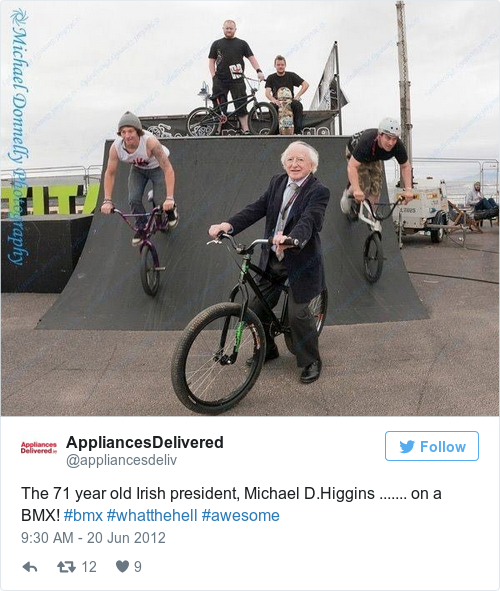 Feedback on “This is the story behind *that* iconic photo of Michael D on a BMX”.